Have you ever relied on business cards for long term promotions? Then you should seriously go for a personalized 2x3.5 round corner business card magnet - 25 mil thickness. This magnet serves longer than 20mil magnets and stays affixed to its surface unless disturbed. Marketers can grab the advertising space to position their brand messages and contact information. Advertisers can make attractive savings on this nicely laminated business card magnet by ordering it in bulk. It makes a good handout during tradeshows and other formal/informal business events. 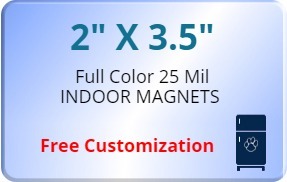 Request a quote to know price savings on bulk orders of custom 2x 3.5 full color business card magnets.